This was sound advice in the world before Facebook, and it’s possibly even better advice in a world where there’s a digital trail of all the things you say and do. The long and short of it is this: No one likes a meanie. And it’s a better experience for you and your fans if you keep the conversation positive, focused on the great things your business or organization is doing, and the things that give value to your fans. There’s a big difference between badmouthing and having an opinion. Just because you shouldn’t badmouth your competition on Facebook, it’s still great for you to have opinions. Badmouthing repels fans, but having opinions might attract them. If you have a comment that could be construed as negative, keep it constructive. And try to stay away from direct digs at your competitors. Besides, there are tons of better ways to engage your fans — just ask my friend, Rich Media. We all know that LinkedIn is a great place to network with others in your industry and promote your business. But just because LinkedIn was tailor-made for professional networking, it doesn’t mean you can’t network with other businesses or organizations, or area experts, as your Facebook Page. Look to build strategic alliances with your industry peers, pros, and patrons on Facebook. It depends on your industry, but you may find you want to “Like” their Page as your Page, comment on or share a story they post, or Like something they say. The goal is not to promote your competitors, but to engage others in your industry. As you engage with them, you may find that they’ll start Liking and sharing your content, giving you an audience with their fans. When you share stories or posts from people in your industry, or even complimentary products or services, you’re acting as a better resource for your fans. If a fan is interested in you, it’s likely that they’ll be interested in getting deeper content about your industry. Rather than seeing others in your industry as no more than competition, see them as sources of good content. Of course, you’ll want to use judgment when sharing content from a competitor. For example, sharing information on a big sale a competitor has coming up might not be the best call, but sharing a whitepaper from a competitor could be a win. 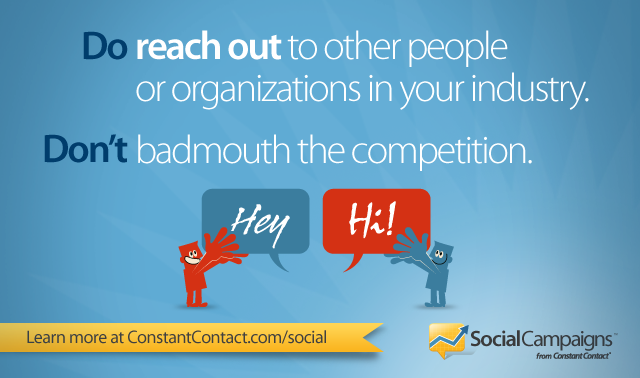 Do reach out to other people or organizations in your industry. Don’t badmouth the competition. Have you been able to successfully network with others in your industry on Facebook? What kinds of challenges do you face? Share your thoughts in the comments section below.